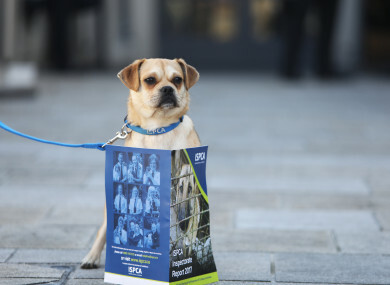 Finn was on hand today as the Irish Society for the Prevention of Cruelty to Animals launched its annual Inspectorate Report at the Mansion House in Dublin. THE ISPCA SAID it received nearly 70,000 calls to its animal cruelty hotline since 2014. The charity today launched its annual Inspectorate Report which highlighted 21 prosecutions which were initiated by the ISPCA under the Animal Health and Welfare Act 2013 (AHWA) that were finalised in court last year. This is more than any previous year. These prosecutions represent some of the horrific cases of animal cruelty and distressing situations ISPCA Inspectors face during the course of their work on a regular basis. There were 16,211 calls were made to the ISPCA’s helpline last year which resulted in 3,273 investigations, 1,250 animals being seized or surrendered, 19 new prosecutions initiated and 21 cases finalised in court. Since the new animals law came into force only four years ago, the ISPCA has handled 69,211 calls, 14,338 investigations, 4,045 animals were seized or surrendered, 111 prosecutions have been initiated and 46 of these having been finalised in court to-date including the 21 finalised in 2017. Last year saw the first prison sentences imposed for offences under the Animal Health and Welfare Act including an 18 month sentence for cruelty offences and a two month custodial sentence imposed on a man who failed to seek appropriate veterinary treatment for a dog with severe injuries to its jaw. ISPCA CEO Dr Andrew Kelly said a lack of resources is stopping the society from helping all the animals which are being mistreated across the country. He said: “Our inspectors have never been under so much pressure and although we recruited a part-time inspector in 2017 bringing the total number to nine, there are large parts of Ireland that our Inspectors cannot reach. Our resources are now stretched to breaking point and we need more inspectors on the ground to deal with reports of animal cruelty. Our aim is to recruit enough inspectors to cover the whole of the country and we are appealing to the Government and the animal loving public to help us with this work. Email “Over 1,200 vulnerable animals were seized by the ISPCA last year”. Feedback on “Over 1,200 vulnerable animals were seized by the ISPCA last year”.